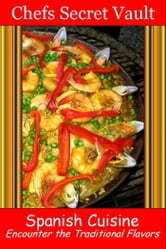 Spanish foods can really make a tasty change in the boring routine of what&apos;s for dinner. We have hand selected 20 Best of the Best and most inviting Spanish recipes like Canary Island Red Mojo Sauce, Maria&apos;s Paella, Beef Tenderloin Asturias, Winter Gazpacho, Basque Cake, Spanish Squash, Slow Cooker Spanish Roast and many more from the Chef&apos;s Secret Vault. Your friends and family will think you&apos;ve been taking lessons in gourmet cooking. So don&apos;t miss this chance to add some treasured recipes to your personal collection today! The Rice Cooker: The Everything Cooker That Never Burns Anything!